The Aga is now (and in truth, has always been) a quintessential feature of the dream British kitchen! Whilst range cooking is no new thing, think Downton Abbey-esque victorian kitchens with large ovens always on the go preparing the next big meal or winter warmer, Agas have seen a resurgence in modern kitchen design. Fast forward to the present, Agas are still right up there on many people’s dream kitchen mostly due to their classic design style coupled with their overall versatile functionality. But unfortunately, an Aga isn’t quite right for everyone, so here we’re going to create a complete guide to buying an Aga to help you work out if it’s the right buy for your kitchen! Setting the Scene – What is an Aga? Whilst many of us are used to using a traditional kitchen oven, an Aga is a versatile, cast iron range cooker that comes in a variety of different combinations and cooking options. If you’re looking to buy brand new, you’ll likely be able to create your own, whereas the second hand market will be flooded with a range of configurations. Whilst no two are ever the exact same, on the whole every Aga will include at least one roasting or simmering oven and either one or two hotplates. Apart from their appearance and versatility, what sets as Aga apart from traditional cookers are the way they actually cook food. Agas utilise a ‘radiant’ heat transfer method which means you can cook food for a far higher duration of time without the risk of your meal drying out. The cast iron DNA of an Aga means they retain heat fantastically, ensuring your food maintains its moisture and tenderness. Another key difference between an Aga and conventional oven is that Agas don’t typically work on a variable heat model. Instead, the different ovens will have a permanent temperature – roasting, simmering and baking ovens all sit at around 250°C, 140°C and 190°C respectively. There are some models of Agas that do give a small amount of temperature control to owners but still not as flexible as other oven options. Despite their long history, Agas have moved with the times and can be purchased with a range of modern design styles as well as fueling types. Whether you run your home on oil, gas or electric, you’ll find an Aga that fits your lifestyle. There’s also no danger of them being an eyesore, with the newest range of Agas coming in a variety of different styles and most recently, up to 15 different colour options. You’re probably thinking, ‘if Agas are so great, why doesn’t everyone have one?’ Well, there’s a few key reasons behind this – let’s take a look at whether an Aga is right for your home! To begin with, Agas aren’t slight appliances. Typically Agas are made to measure and given their complex and sturdy make up, simply won’t fit into many different kitchens. Coupled with extra infrastructure to run and support them, unfortunately your kitchen simply may not be able to handle the british classic. It’s always best to do thorough research into the type of Aga you want and ensure your kitchen is up to the task. So, Agas are pretty big but they’re also pretty heavy! Given they are made of pure cast iron, an Aga can weigh anywhere up to 450KG which again may rule them out as an option for your kitchen. Given these characteristics, Agas require specialist removals and installations teams to set up and given their ‘all-in-one’ make up, often don’t come apart, making logistics a struggle. If you’re thinking of making a move on the property ladder anytime soon, maybe hold off on the Aga until you’re sure it will fit in your next home! Even when you get the Aga into the kitchen, the considerations don’t end there! Traditional Agas weren’t designed to be turned off and were traditionally kept on 24/7 to not only provide a hearty meal, but to heat the entire home. Given this, Agas have considerably higher running costs than a traditional oven. A full brief of typical running costs can be found on Agas website, with the manufacturer very upfront about the ongoing investment of having one in your kitchen. It’s always advisable to forecast in the running costs into your budget to ensure buying an Aga is a sensible decision all round! I’m Ready – How Do I Get an Aga in my Kitchen? Given that an Aga is a specialist appliance, retailers, installers and configurators are few and far between in the UK. Prices vary widely depending on the size, shape and configuration of the Aga in question but expect to pay somewhere between £6000 – £13000 brand new for your very own british icon. A great way to upgrade your kitchen on a budget is to take the reconditioned aga route – ensuring a reliable and certified Aga is installed into your kitchen for a fraction of the price. 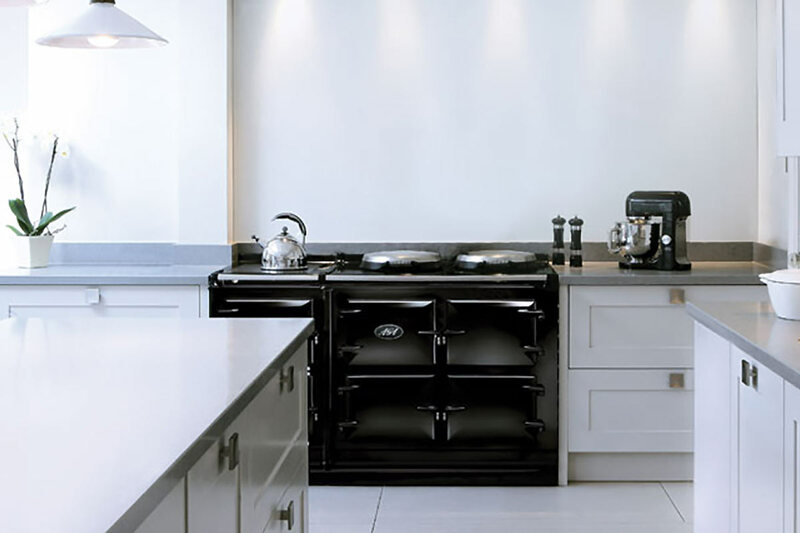 Naturally, we’d only recommend going through professional Aga and Range Oven specialists who will advise on the best services for your needs such as renovation, transportation and installation. The popularity of Agas has only increased throughout their 100 year history and are still a highly sought after addition to any british kitchen. Finding an Aga that’s right for you can be tough with many considerations to make in comparison to standard ovens with the challenge of installation and transportation placed on top. Many buyers head for a reconditioned aga to save on price whilst getting the classic Aga experience we all know and love!